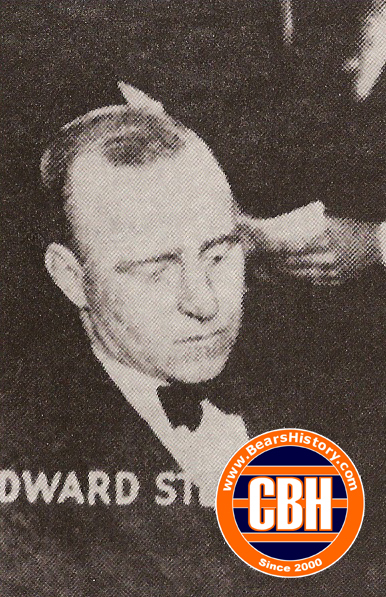 Dutch Sternaman will forever be known better for coming close to snatching ownership of the Chicago Bears from George "Papa Bear" Halas, but he should not be forgotten as one of the pioneers of the Bears and the NFL. Sternaman played halfback at the University of Illinois with Halas, and played on the first Decatur Staley team. When A.E. Staley encouraged Halas to take the team north to Chicago where it might survive, Sternaman became an eager part owner of the club. He also continued to play halfback for the team until 1930. As is famously documented, during the Great Depression Sternaman lost money in bad investments, and arranged for Halas to buy out his share of the team. The agreement had a deadline for Halas to make final payment or lose everything he had invested to Sternaman. According to Halas, he made the final payment with just minutes to spare. How the Bears might have changed over the years had Halas not continued to own the team we will never know, but Sternaman's contributions to the team in its vital first decade should not be forgotten.